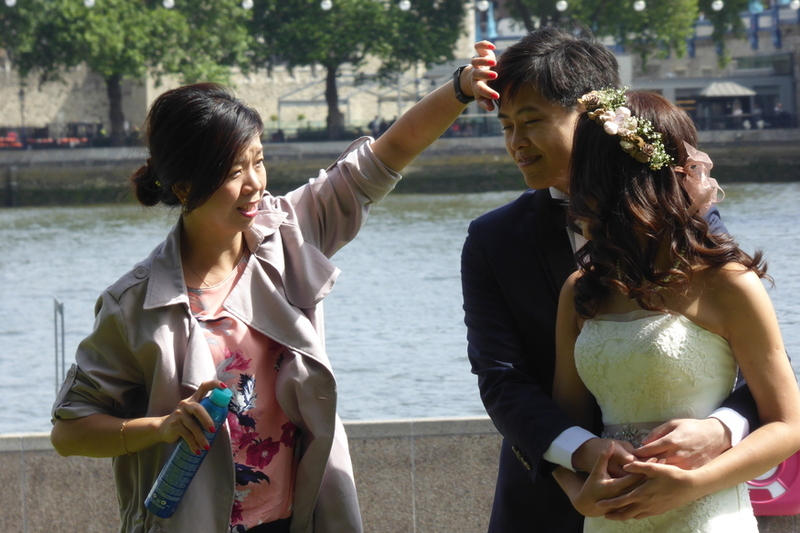 James FitzGerald What's With All The Chinese Wedding Photos In London? There’s the wooing, the proposal, the vows – and all the other hoops which couples are told to jump through in order to prove they love each other and should be bound together in matrimony. 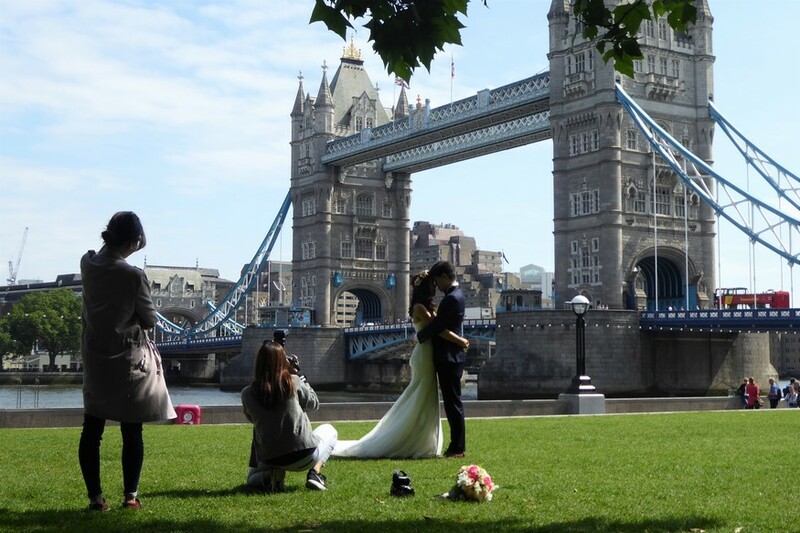 And then there is the Chinese pre-wedding London photoshoot. Because have you truly tied the knot unless you’ve flown to a city on the other side of the world, acted out the “I do” moment in front of a grand monument you’ve never seen before, and forked out thousands of pounds to get the photos taken to prove it? Bill and Ivy don’t know when they’re getting married. In fact, they don’t even know when they’re getting engaged. But evidently this is no barrier to girlfriend and boyfriend getting decked out in their wedding gear for a few hundred snaps alongside the Thames. Turns out it’s all quite normal. “Where we’re from, people do this sometimes”, laughs Ivy. There are no rules around not seeing the bride in her dress before the big day. Other eastern marriage customs can be pretty relaxed, too – the proposal itself, for example, is sometimes little more than a pre-agreed formality. She has a marketing job; he works in a bank. Together they go running, play board games, and watch Korean dramas. 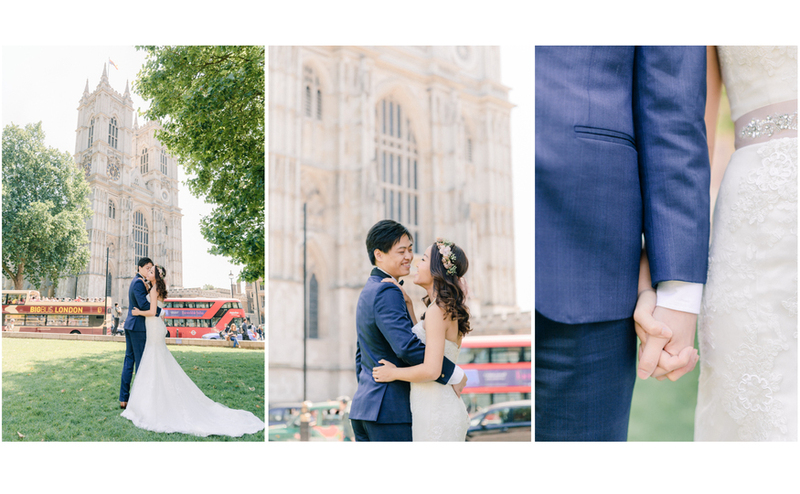 But what sets them apart from many couples you might encounter here in London is that they’re willing to make a 12,000-mile round trip just to get some photos taken. Why do it? His excitement as he looks upon Tower Bridge for the first time is something to behold. While his wife-to-be was a student here in the UK, the guy has never so much as set foot in Europe before. Look this way, look that way. Kiss her, pick her up, give us a little pirouette..! Buzzing about the couple in a frenzy is Terry Li, an irrepressible photographer powered on protein drinks and an extremely full diary. In past peak seasons, she has ended up doing as many as 10 pre-wedding commissions in just a couple of weeks. Planning, shooting, post-production - everything. This is a tough job. Starting early in the morning, Terry works for hours at a time without a break. The clients can be demanding – and the British weather unsympathetic – but luckily neither is the case today. The sunlight is playing beautifully off the river and everyone’s having a good time. 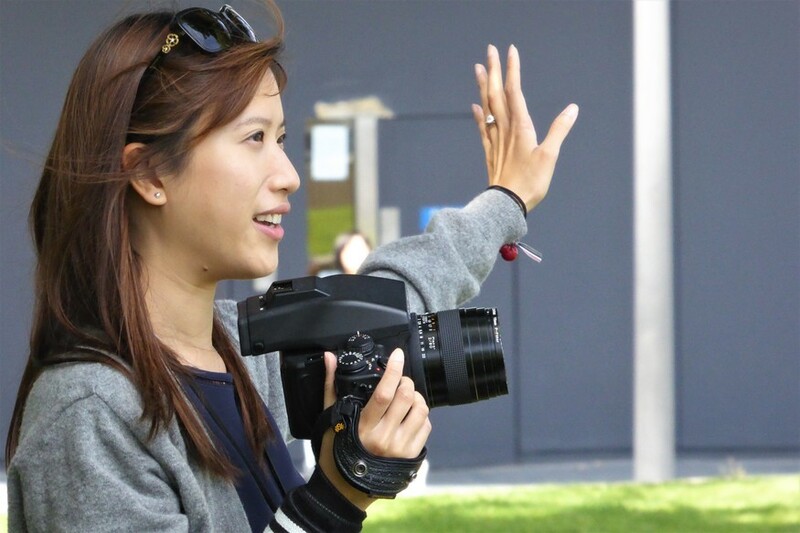 The Hong Kong-born snapper has now been living in London for 13 years. Why has she found this particular service in such high demand lately? 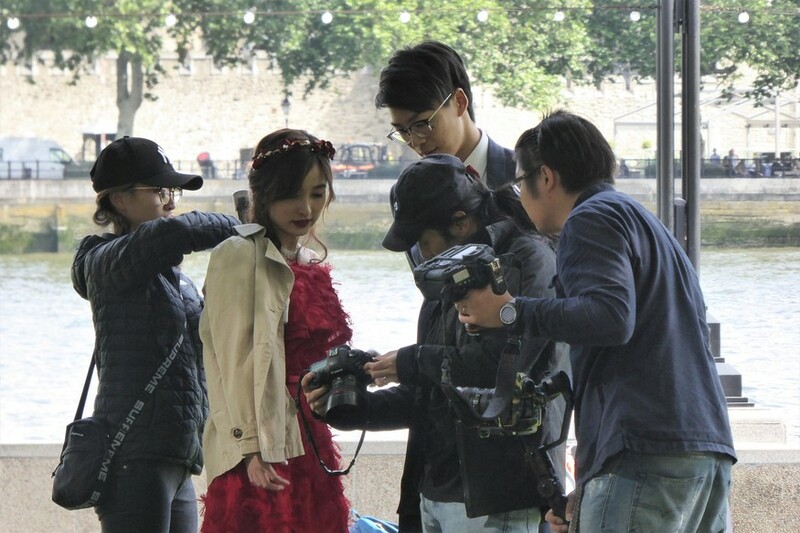 It’s common for wealthier Chinese people to fly over a whole team for that exact purpose — putting up photographers and makeup artists in hotels, and gallivanting round the UK’s most romantic photo spots. The pre-nuptial photoshoot is such a rigmarole these days that at one point it almost looks like our group will have to contest a well-trodden spot of greenery overlooking Tower Bridge with another, much larger entourage. They’re a dark-clad army, these boys - stuffed with assistants, technicians, and unidentifiable supervisors of all sorts. They seem to be taking things quite seriously. Just as pre-wedding photography is a case of different snaps for different chaps and chapettes, it’ll come as no surprise that cultural nuances, too, have a huge bearing on who Terry’s patrons are. “There’s an attitude of wanting to work with your ‘own’ people,” she tells us. While Hong Kong shares many of its wedding traditions with the Chinese mainland — at least to western eyes — that certainly doesn’t mean she’ll get as many enquiries from China as she will from Hong Kong. All of that is before you even get onto the question of language: another minefield altogether. Still, at least the human perception of beauty transcends nations, languages, and borders… right? Maintaining her own quiet orbit around the happy couple during this lavish game of dress-up is Jennie Lam. She comes swooping in with the odd dab of this; the odd spray of that. The woman tasked with making today’s ‘bride’ sparkle like Markle is just one of several makeup artists on Terry’s roster. She’s deployed selectively depending on the nationality of the customer. “Asians often favour what we call the ‘double eyelid’ effect,” she tells us. “I use bits of tape to create the illusion that a woman’s eyes are rounder than they are — something we view as beautiful. 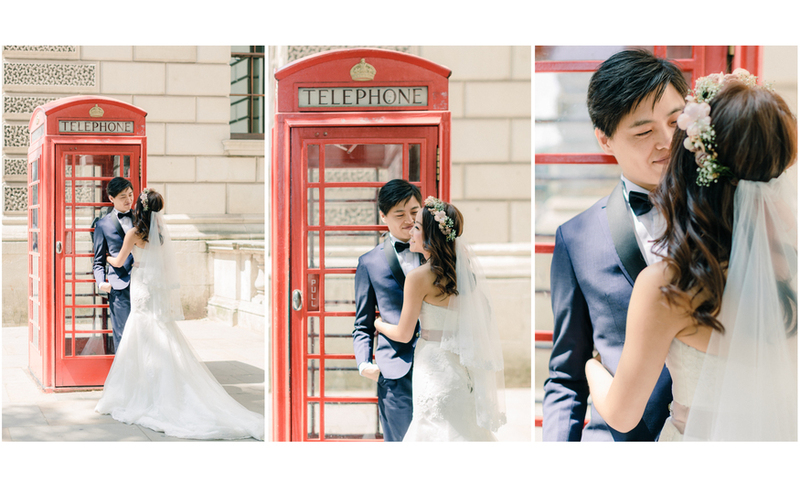 If Chinese pre-wedding photoshoots in London seem to you to happen in something of a snow-globe - a little bubble of eastern culture in front of your eyes that’s somehow rather closed-off and alien — there is a good reason. The demands that come with these high-cost commissions are again highly culture-specific. Jennie’s here because she knows how Hongkongers do their faces in the morning. The day passes with schoolchildren whooping at us, and passers-by stopping to grab their own pictures of the spectacle. Even we can’t resist getting our own selfie with Bill and Ivy. A man and woman striking poses in their marital gear on the streets — once a novelty; now as commonplace as any other lucrative industry. We’re not sure we’d go to Hong Kong to get the same thing done, but we’re grateful for the bizarre little window of the Far East it’s brought over to us.